Relaxation Therapy – for mind and body wellness. As specialists in marine spa therapies, Thalgo harnesses all the riches of the sea; oligo-elements, proteins, amino-acids, minerals and vitamins, Slimming, Firming, Detox and Relaxation. Gently, soften and smooth away dryness. Full Body treatment including Relaxing Massage with a “Thermal Cocooning Wrap” for an Anti-Ageing effect. 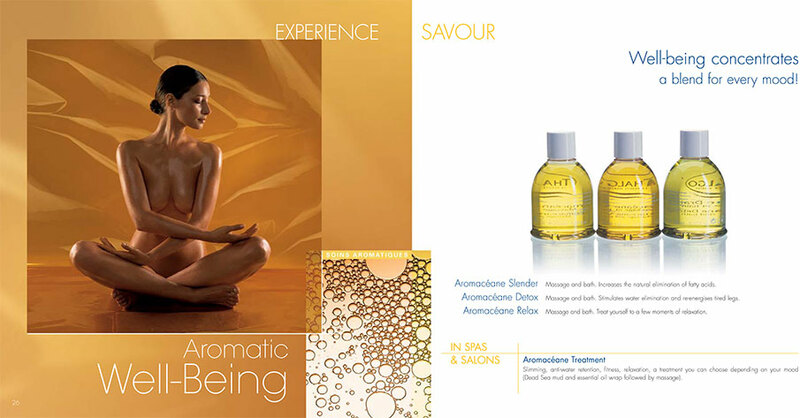 “Relax You” with an Aromatherapy Massage. Exfoliation, Algae extracts, Revitalizing Aromatherapy massage, Re-Mineralizing Marine Mud Wrap. Replace lost vital skin minerals and re-hydrate and nourish your skin deeply to firm and rejuvenate as well as help body eliminate toxins. providing a draining and slimming action reducing cellulitis. We recommend series of 6-12 treatments for Optimum results. Swedish Massage ......good treatment to help alleviate sore muscles and relax away tension. Swedish massage is a hands on technique best known for its long smooth flowing movements, including deeper movements of kneading, petrissage and vibration techniques. Slow down with a very relaxing massage, super light touch to assist the body's lymphatic flow. Lymphatic fluid feeds the surface of our skin and detoxifies and carries waste to the body‘s purification system of the lymph nodes. Developed by DR Vodder originally to treat burn victims. This beneficial treatment can help to treat edema, excess fluid, and puffiness, detoxifies, helps improve a sluggish circulatory system, aiding in carrying nourishment to the cells and eliminating toxins and waste. All the benefits listed above but specifically for the facial lymphatic zones.